Verona is located in near vicinity of many recognized wine areas, but I can’t see that it has a lot of dynamic wine bars. One can always go to the Antica Bottega, that boasts hundreds of wines, not least for references, as they present many of the leading houses in several vintages. But I am more attracted to the smaller, distinctive bars with a clear idea, call it underground, avant-garde, rock’n’roll, jazz or whatever you like – especially when the idea is to present organic, natural, artisan wines, that the proprietors and sommeliers have a personal relation to. 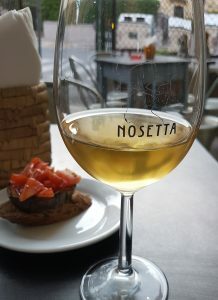 Osteria Nosetta is located in the pleasant neighbourhood of Borgo Venezia, just outside Verona center. And Nosetta is the kind of place that I am talking about. The restaurant is intimate and full of atmosphere, the decor is a rustic, retro, and the music was vintage jazz on vinyl when I was there. 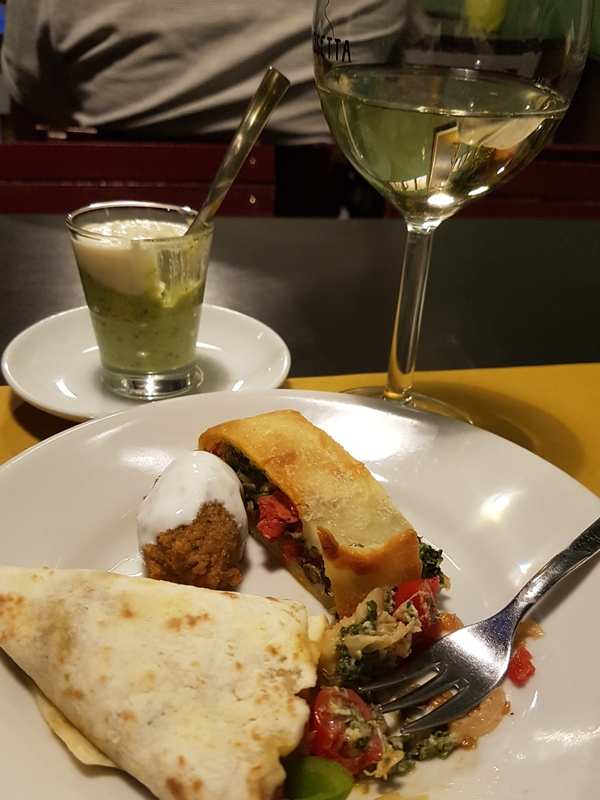 The food is without limits; their small dishes -locally called ‘cicchetti’- are vegetarian, vegan, and you can have fish and meat too. The kitchen is based on fresh ingredients. 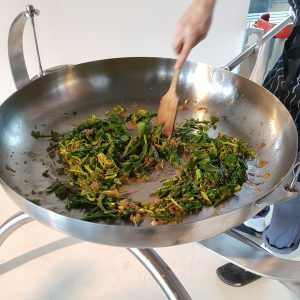 The inspiration is from various places though, not least Asian-middle east, and there are some vegan dishes alongside more usual Italo-European stuff. The menu of the day was taped onto page 98 and 99 in an old paperback. And the prices are undoubtedly to live with. 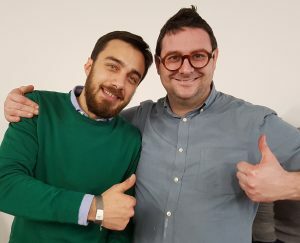 Lorenzo Folati has been leading the venture until now, but Andrea Venturini and a couple of friends are in a period of taking over. They have a fine selection of wines and beers from independent artisan producers. 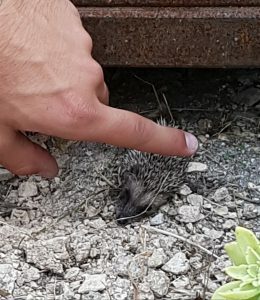 I enjoy picking smaller ‘bites’ among those displayed at the bar, to go with a few glass of wines. Some were mint glass, a falafel, various greens, such as the delicious tomatoes, frittered squid, tomato and eggplant sandwich, zucchini with cous-cous, onions, honey and balsamico, and -why not- chocolate salami. The list goes on. 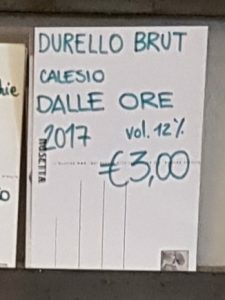 Durello 2017 (Calesio dalle Ore) is made with the charmat-method. It’s a light coloured, apples, citrus, and bread scented, light-bodied sparkler with good acidity. Simple and good. Trachite 2016 (Alla Costiera), an unfiltered, yellow and cloudy moscato-prunella-garganega regional Veneto white with a sweet (moscato) sensation, together with flowers and citrus peel, and with a medium body, light tannin, and slightly bitter aftertaste. Lugana 2015 (Marangona). This is a lugana from 100% turbiana grapes. It’s a fresh, simple, dry wine with light, almost blank colour, with a greenish hint. And the aroma is dominated by pears and citrus. On the contrary, the next wine, was all but simple. 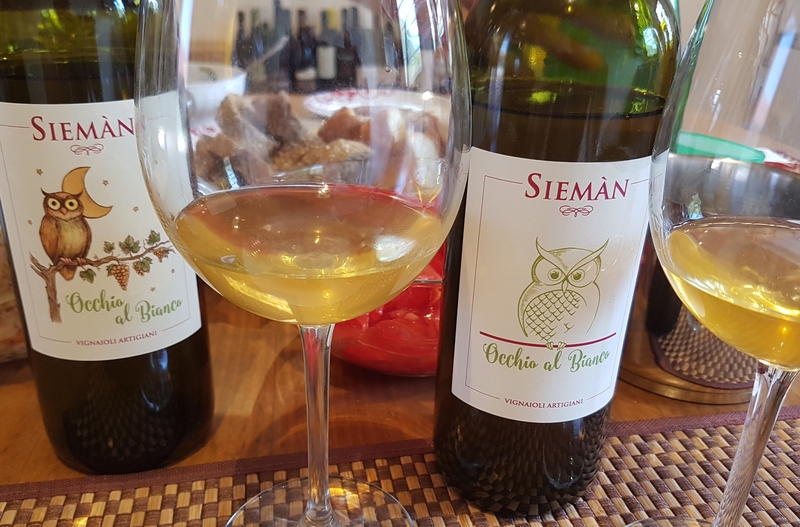 Sassaia 2016 (Angiolino Maule), a varietal garganega showed light yellow, slightly turbid, and on the nose could be found mature apples, flowers, ginger and a touch of toast. Slightly yeasty, quite full and with decently acidity, all in perfect harmony. Maule is a long time favourite, and there is a report from a visit in an earlier post in this series. Musella is one of the better producers of both standard valpolicella and amarone. Here is a white IGT from the Valpolicella area, biodynamically cultivated as always. Pinot Bianco “Fibio” 2014, from that variety, is a bit more on the wild side. Yellow with green hints, smells deliciously of flowers, yellow apples, and I would say, plays with oxidation. Quite slender, integrated acidity, very pure, and the fruit shines on to the end. 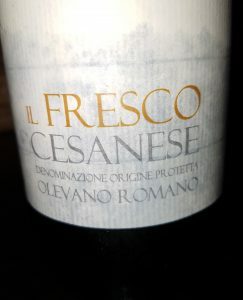 On to a real rarity: Il Fresco Cesane 2014 (Marco Antonelli), that is from the DOC (sometimes: Cesane di) Olevano Romano, Lazio. Got it? 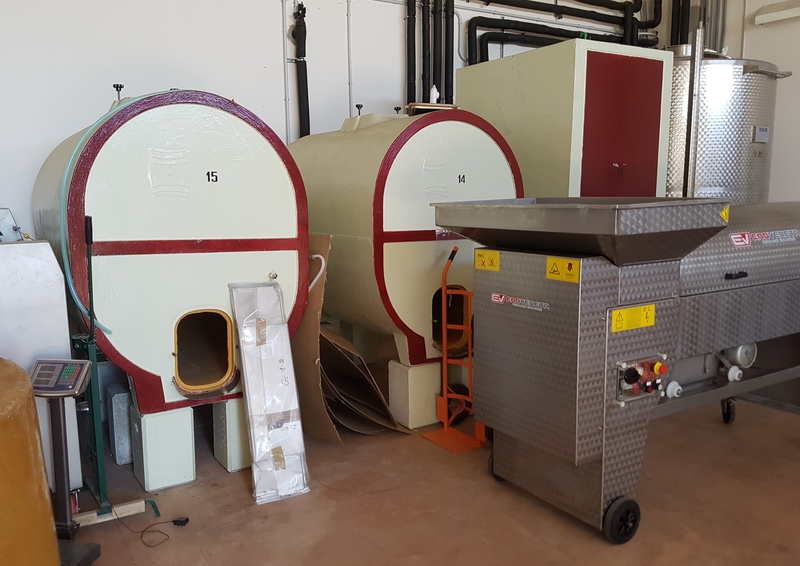 The production area lies in the province of Roma and includes the municipality of Olevano Romano and, in part, Genazzan. The wine was nice enough; cherry red, red fruits, plums, and hints of leather on the nose; smooth, juicy, and with an adequate acidity. 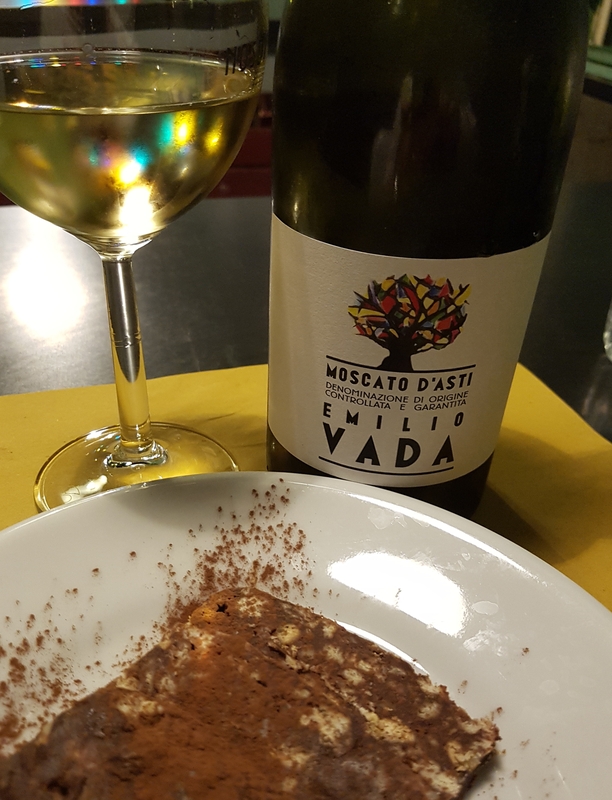 We close the chapter from this gem of a wine bar with another pleasant surprise, nothing sensational, but better than most of its kind, a Moscato d’Asti 2017 from producer Emilio Vada. We are talking about a straw yellow coloured wine with the typical moscato rose aromas, clean, and pure. It’s a lightweight, but it has an inspiring acidity and it’s not sticky sweet, compared to what you often can find in this category. The alcohol here is 5%. Filippo Filippi is a top producer; not only of a high esteem, but the vineyards are also the highest in Soave. (See an earlier post.) Compared to other regions it’s not very high, only 400-something, but combined with the cool winds and the soils it’s just enough to give freshness to the wines. We are in Castelcerino, a district (‘frazione’ in Italian) of the small, picturesque Soave town. This is the northernmost part of the wine area. It borders with the Val d’Alpone to the east, the last of a series of parallel valleys in the Verona province that brings cool air down from the pre-Alp Lessini mountains. To the east of the valley is the Monte Calvarino, where there was a underwater volcano. 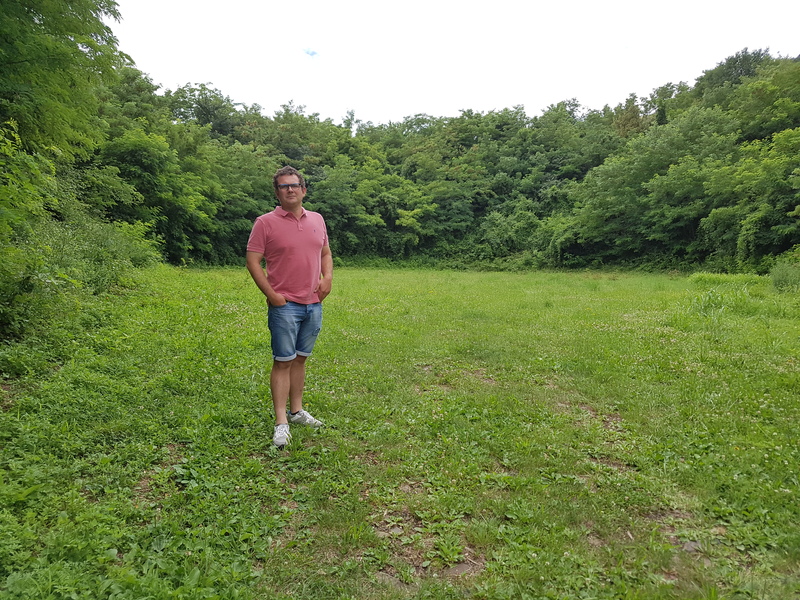 You can read more about this and see some pictures in the article about Gambellara. While the ground in Gambellara, Vicenza province, is almost entirely volcanic, Verona is more varied. But there is a lot in the eastern part of Verona too. The estate has belonged to the family since the 12th Century, but the winegrowing didn’t start untill a hundred years ago or so. Most of the around 20 hectares of vineyards were planted in the 1950’s, and the farming is now biodynamic. When we say family, there are really two. The company’s official name is Visco & Filippi, the former being the family name of Filippo’s mother. We were walking around the beautiful estate. 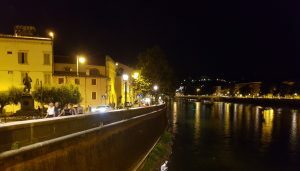 Here it’s almost like time has stood still, quiet, except for the sounds from the crickets and some birds, and very different from the A4 motorway and the Soave-San Bonifacio exit we passed only 5 minutes ago. There is forest all around. As you have already seen, the family has a long and deep relationship with this beautiful and historic property. So it’s no wonder that Filippo is more focused on expressing the virtues of each plot and their individual characteristics, rather than promoting the DOC Soave. There are many others who take care of that, we could add. To achieve his goals he sticks to the principles of old vines, organic farming and low yields, again contrary to many others in the area. Filippo is a fan of the ‘pergola veronese’ binding method. It’s perfect for garganega, because this variety is very productive, so it is protected by the leaves. He has introduced Guyot in some of his sites too, to see how it works. In the cellar too, it’s mostly a low-intervention attitude. Though some modern techniques are used, such as temperature-controlled steel vats, and some movements by gravity. But generally it’s just like in the old days; in the ageing room the temperatures vary according to the seasons. On the question if it’s easy to get the fermentation going, Filippo laughs and says no: “piano, piano” (‘wait’) he adds. 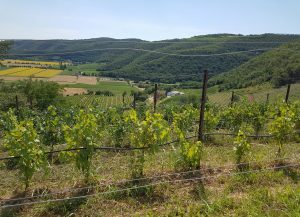 The vineyards vary considerably in composition, including soils of basalt, limestone, sand, and clay in the property’s five parcels: Castelcerino, Vigne della Brà, Monteseroni, Turbiana, and Calprea. 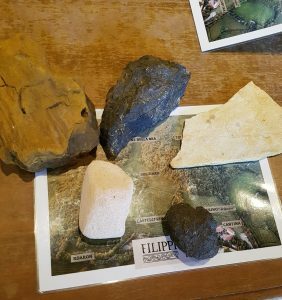 For the tasting Filippo presented a map of the vineyards, and a stone that represented the most dominant soil on each plot. Here are some brief comments. We started with Castelcerino 2016, a garganega from two parcels at 320 meters of volcanic soil, and southeast exposure. The wine is made in stainless steel vats. It’s light in colour with a yellowish (or: slightly brown) tinge; aromas of apples, white flowers, almonds; very tasteful, slightly bitter in the aftertaste (a garganega feature), mineral salt (from the volacanic soil), and with 3 grams residual sugar it was rounded off against the acidity. 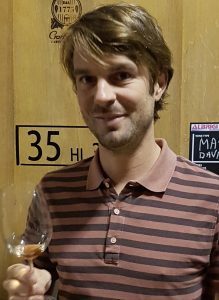 He works with fine lees in all the wines, mostly 8-9 months, but one wine stayed on the lees for no less than 56 months. It doesn’t masque the terroir, according to Filippi, because the character of soil and grape are that strong. Vigne della Brà 2016 comes from a 60-70 year old vineyard at 380 meters, with southwestern exposure. 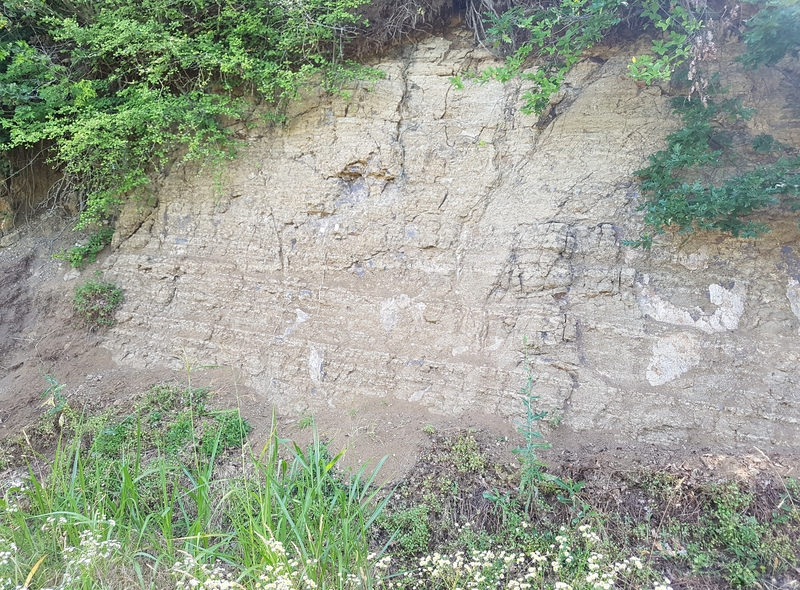 The soils shifts between clay and sand, with some basalt and limestone. Like the former wine it’s a varietal garganega elevated in steel. It stayed there for 14 months on the lees. The appearance is light and clear; aromas of apples, flowers, mint, melissa; more acidity than the previous wine, refreshing, and with a slight bitterness. It was not filtered, not clarified, but it had been moved between different vessels a couple of times before a late bottling. It’s not very unlike the former, but more acidic, refined and elegant. While the two first wines are DOC Soave, the next two are IGT Veneto. Monteseroni 2016 is from the estate’s warmest site, the south-exposed vinayard at 350 meters, with mostly calcareous soils. It was accordingly more yellow in colour; more mature apples in the aroma, together with flowers and herbs. We can say that it was a bit “wilder”. It was also fuller, pure and tasty and long, but with less acidity as the Brà. In general this vineyard has 70-80 year old vines, but some are younger. The soil is calcareous. Turbiana 2016: This is the trebbiano di Soave (also called ‘turbiana’) from that highest elevated vineyard at around 400 meters. The soil here is very poor, rocky and sandy, and the yields are low. It’s elevated in stainless steel, where it has contact with the lees for at least 6 months. Light in colour; mature apples and mint on the nose; round and balanced, with a natural acidity. It has the lowest quantity of SO2 of all his wines. 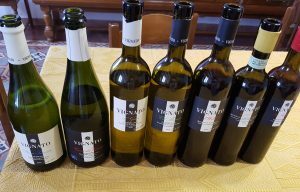 After this we tried some Castelcerino wines to see how they were developing: Castelcerino 2015 (from the part called “drio casa”): Yellow; honeyed at the beginning, spices, white fruites, medium full, mineral, salt. 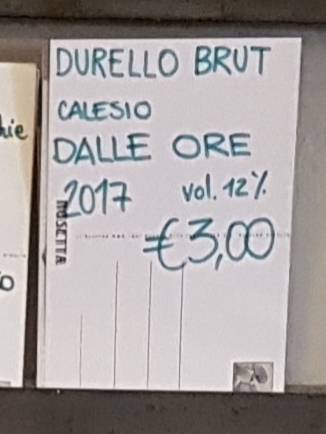 Castelcerino 12 “56 mesi sui lieviti – Foglio 1”. You have now guessed that this was the 56 months on the lees wine that I talked about. The designation “foglio 1” means that this was the first vineyard to be mapped in the Soave commune (at that time it was called Alberti, by the way). Filippo proudly shows me that map as evidence. The wine: Yellow colour; mature apples, followd by rounded citrus like clementines, and some notes of apricot/nectarines and mynth; grapey and round in the mouth and genereally elegant. We also had a glance the other way, towards the future, with tank samples of Castelcerino and Vigne della Brà 2017. This was a hotter year, with some hail in the end of august. This showed in the samples, but this is just the way it is. Coming from Tenuta l’Armonia, crossing the A4 motorway I arrive in the small settlement of Villaga after three quarter of an hour. We are now in the Colli Berici area. 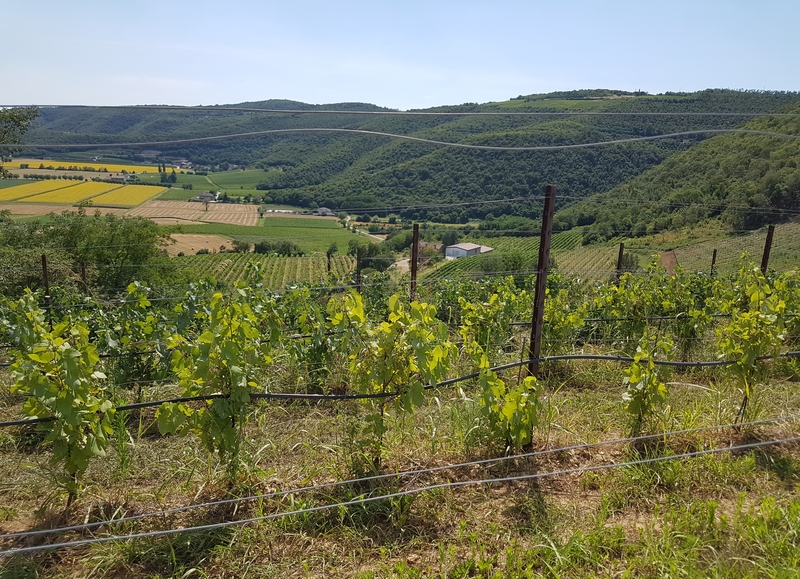 Siemàn has nine hectares, but only four is planted with vines, since it’s important to maintain the biodiversity of animals and plants. 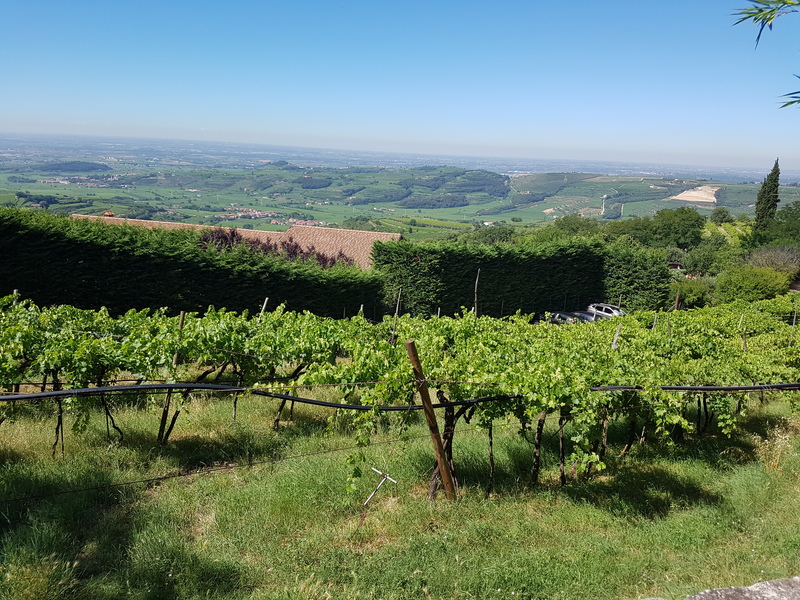 We went to the top of the hill, where we got a magnificent view of the slopes with the naturally ventilated vineyards and we could see as far as the Apennines. The ground is limestone, some clay, and where the tai rosso (aka tokai rosso, aka grenache) is one of the most prominent grapes. Siemàn means “six hands” in the local dialect. 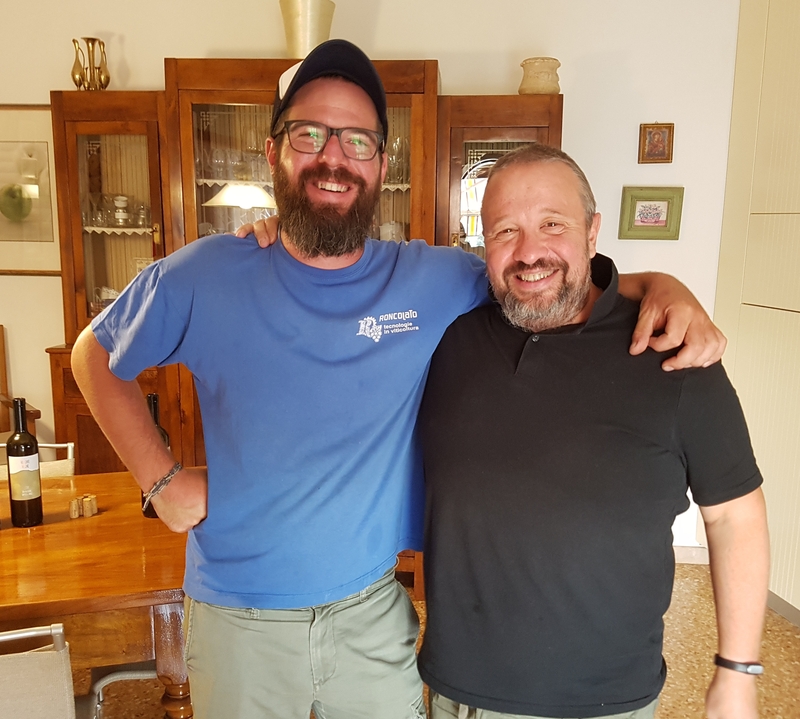 I am welcomed by four of them, Daniele and Marco Filippini, who share the duties in wine. 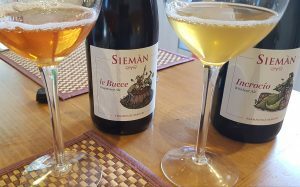 Siemàn also makes beer, from grapes! – and it’s the third brother Andrea who takes care of that part. The owl in the logo must be explained by Italian terms: Owl is gufo in Italian, and gufare means to be lucky. -We all have other professional backgrounds, explains Daniele and Marco. So the people said, you can’t succeed. So the owl has become a symbol for being a bearer of luck, and so far it seems that it was a lucky choice of logo. The brothers have a low-intervention attitude, and there is meticulous cleaning at all stages. They don’t use pesticides or any chemicals in the vineyards. The grapes are almost exclusively autochthonous. 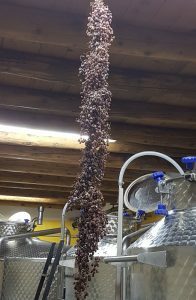 In the cellar, fermentations takes place spontaneously with native yeasts, and nothing is added (except for a small quantity of sulphites, when necessary). The wines are kept in barrels, concrete and steel, according to what the consider best to express grape variety and land. There is a high proportion of limestone in the vineyards, compared to the volcanic of the north side of the main road. There are two illnesses in the vineyards that need to be watched, oïdium and downy mildew. Oïdium is treated with sulphur. When it smells of mushroom you cut it off and throw it away. Mildew is normally treated with copper (mixed with water and sprayed onto the leaves). When the leaf looks as if it has oil on it, this part is burnt off. It is important to say though, that the amounts of both copper and sulphur are kept much lower than the legal maximum. This because they use fungus as a natural treatment to minimize addition of copper. The first harvest was in 2013 (without label). –Angiolino Maule helped us in the beginning, say the brothers. (Read about his estate and wines here and in the article about Gambellara.) 2014, a very rainy year, was the first vintage on sale. The plantings are young also, only 4-6 years old. But all the wines have something to them. They are luscious, tasty and with a mineral character. And they will only get better in the coming vintages. -We are improving every year, says Daniele. And it’s easy to believe. 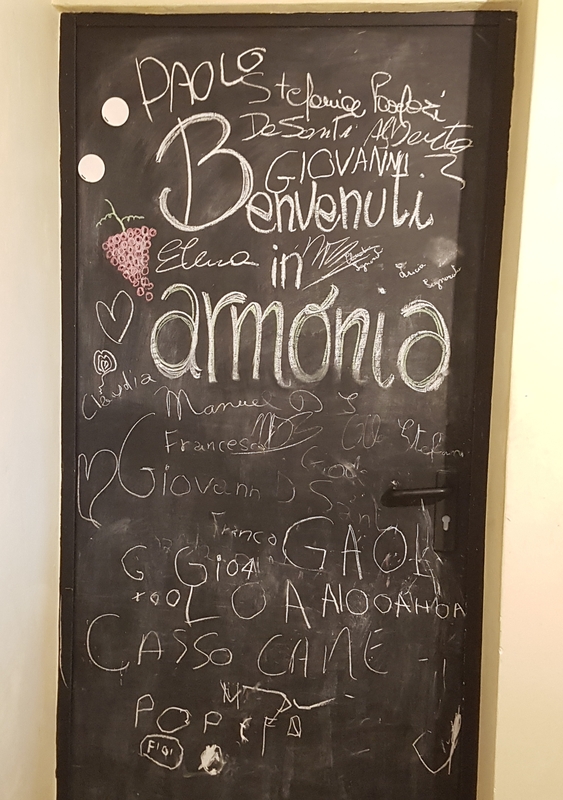 Camaleonte 2017 is a pét nat with second fermentation in bottle, from the grape varieties tai rosso, garganega and incrocio manzoni, the two latter (the white grapes) with two days skin-contact. The colour is deep yellow; on the nose some bread and citrus notes. an easy-drinking wine. 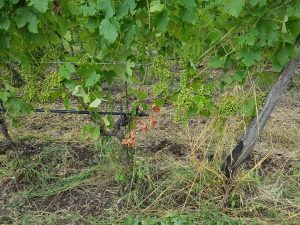 In 2017 there were hailstorms that caused a 30% loss of grapes, says Daniele. 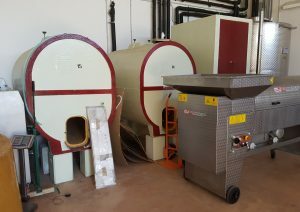 For the white and red wines, half is fermented in concrete, half in wood, then put together in stainless steel before bottling. 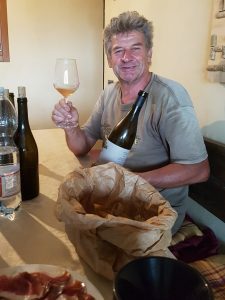 Occhio al Bianco 2017, a still wine from that vintage -grapes garganega, tai bianco, and in some vintages incrocio manzoni- had shorter skin-contact and was subsequently lighter yellow, and also somewhat cloudy; white flowers and herbs on the nose; tasty with a salty mineral character in the finish. not very different was the 2016 version of the same wine: tai bianco and garganega, golden colour; white flowers like chamomile, and a slight touch of peel after 3 days of skin-contact. Mosca Bianca 2016, from 90% garganega and 10% moscato, stayed 2 days with skins. It’s yellow golden, aromatic with flowers (the small amount of moscato shines through), and a round body. The 2017 had only 1 day skin-contact, and another difference was the grape composition, 50/50 garganega/moscato. This one had some peel character, but only a little. For me it was still more aromatic, in the moscato way. This wine come from a rented vineyard in Colli Euganei (to the east, in the Padova province), and has volcanic soil. It has 5,5-6 g/L acidity, like all the wines. All wines also come with less than 15 mg total SO2 (the current selection between 2-14). Occhio al Rosso is their only red wine, from tai rosso. The 2017 was the lightest of the lot (bright ruby), and maybe not as expressive; as the others; nice and juicy with some fresh cherry fruit though. 2016 was a hot summer. This wine was the darkest of the three; red fruits, cherry, blackberry; and fruit all the way. In the 2015 no sulphur was added, and I think there was some brett in the aftertaste. To me it doesn’t matter at these low levels. Furthermore, it was very fruitdriven, with red berries in the front. The colour was light cherry, and the appearance clear too. Both beers are in a sour ale style. Le Bucce is spontaneously fermented with yeasts of grapes (tai rosso, red grapes). The other is the Incocio, from the white grape incrocio manzoni. The grapes are the main reason for the difference in colour. Veneto has so much to offer. 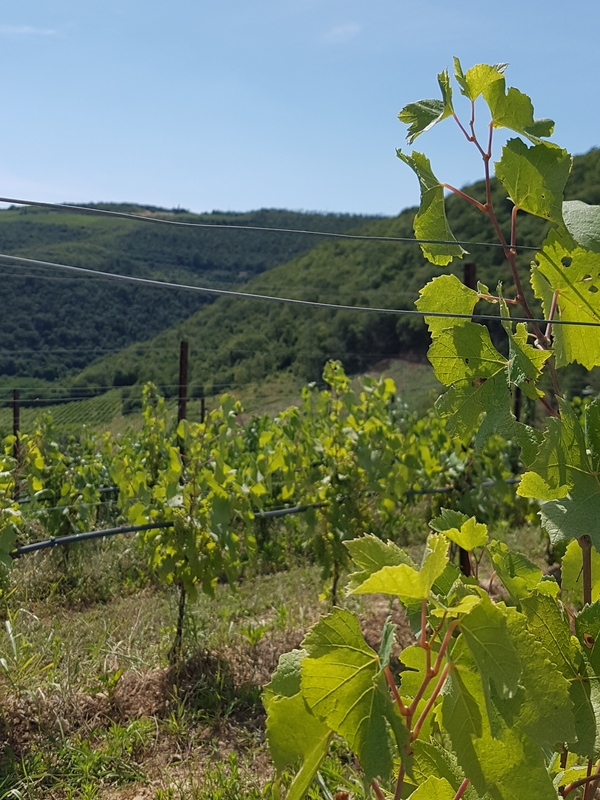 It’s enough to mention Valpolicella (with its ripasso and amarone), Soave, and we have now learned about Gambellara – each of these with their own sweet recioto. Then there is of course Prosecco, that the Veneto region must share with neighbouring Friuli. 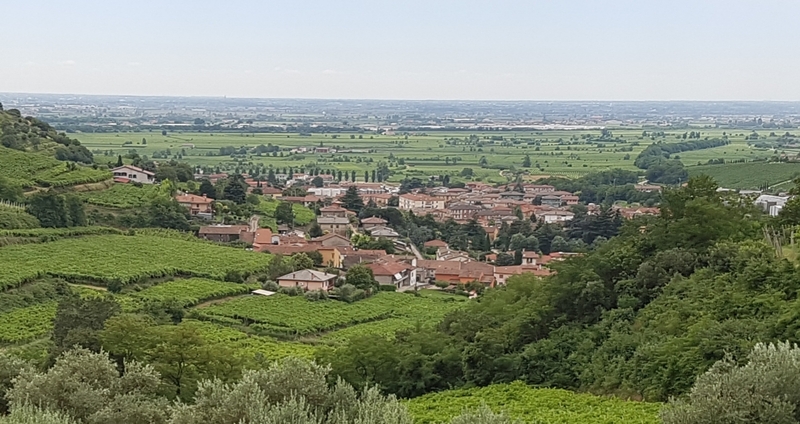 Remembering that Gambellara is also Vicenza, now we shall talk about three more wineries located across the province. To try and keep it inside the blog format we will divide it into three parts. And we start with, freely after Tennessee Williams: An Estate called Harmony. Andrea Pendin’s Tenuta l’Armonia is found in the small settlement of Bernuffi, municipality of Montecchio Maggiore. That means if you can find it after the narrow, long and winding roads. Arriving there you can experience the perfect harmony, and see for yourself the co-exsistence of people, land, chicken, turkies, and all the small creatures found in the vineyards. 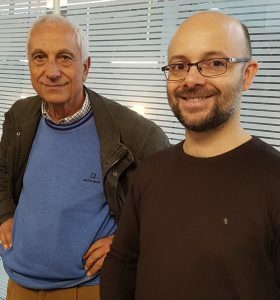 It’s Lorenzo Fiorin who meets me. He’s working in export, but also a little bit of everything else, as it is useful to have an overview over the whole situation. The estate has 10 hectares of vineyards planted with both indigenous and international varieties. It’s quite new, from 2008, but some vines are more than 60 years old. 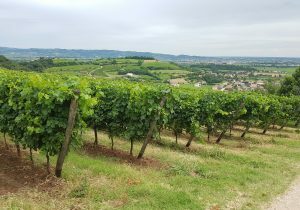 The vines are planted in the slopes and on top of a hill, in various exposures. Around 40.000 bottles are made per year, from own and rented plots (7 more hectares). The soil here is volcanic with some schist and chalk. There is an amphitheater with white soil (chalk), shells and other fossils. Towards Verona in the west there is volcanic soil, and also tufa towards the south of Verona. Both indigenous and international varieties are used. We walk past a planting done three years ago; merlot, syrah, cabernet franc etc. -The varieties are not the most important, says Lorenzo. -It’s the terroir, and also see how the grapes react together with it. -A grape we really believe in is durella, especially for its acidity, but also for its history. It is really one of the traditional grapes here in Vicenza. One has already understood that the cultivation is organic and biodynamic, so it’s about maintaining and stimulating biodiversity. Mint grows naturally in the vineyard, oat too. Green manure (based on plants and flowers) is employed. The idea of harmony, the balance in nature, is also a message that winemaker David Xodo has preached from the very beginning. -In the long run we don’t need to work as much as with “chemical agriculture”, because the biodiversity we have created is holding itself up, says Lorenzo. -Furthermore, Veneto is a cool place, always windy. It’s then easier to work the vineyards organically. A light breeze is also welcome walking around the estate on a hot summer day like this. Andrea is a trained chef, so the chickens and the turkeys in his Garden of Eden shouldn’t feel too safe… He has also a stove with a pizza oven that can do magical things. There had been a party, with a lot of leftovers, and some other wines that had been opened up to 13 days before. so we had a lot to sample. Basically there are two different lines. 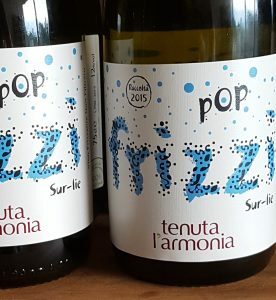 “Pop” consists of high quality “easy” natural wines at a good price. “Cru” is a premium line from native varieties in clay and limestone. Here are some very brief notes. Frizzi 2015 is a pét nat, or col fòndo sur lie at 12%. it’s a simple, easy, un-oaked, appley, not very structured, lightly bubbly wine. Pinot noir had a bad year, so pinot bianco and chardonnay were used together with the usual durella, the acidic grape that made Vicenza special in the past. Frizzi 2017: Here was pinot noir fully ripe, so there is 60% and the rest durella. No maceration, no filtration. The only problem with our bottle was that there were no bubbles, as the re-fermentation had apparently not started yet. Another bottle of the same wine as better: Light salmon red, a touch sweeter; strawberry, apple, and a crisp acidity. Pop is a series with more volcanic soil than the Cru, and doesn’t ripe that much. Bianco “Pop” comes from a relatively high altitude vineyard at 500 meters. 2017 is light yellow with appley aroma and fresh acidity. The 2016 I find a little more ripe. This has some incrocio manzoni (or: manzoni bianco), a cross between riesling and madeleine royal. We also tried the 2012: Lightly browning, orange peel (from longer maturation on skins), ginger notes (from a proportion of garganega). For that vintage some carbonic maceration was used. -Acidity is what binds them together, Lorenzo points out. And rightly so. Perla 2016. This is a “Cru”, which means smaller area, lower yield, older garganega plants (60-80 years). This is a varietal garganega, both early harvest and late harvest (with some botrytis), then blended. Andrea is a good friend of Sébastien Riffault of Loire, and it was Sébastien who gave him the inspiration for different harvest times. The wine shows a complex aroma of mature apples, nuts, flowers, apricot, towards honey; medium full on the palate, and a salty, mineral aftertaste. The acidity is there, but it’snot pungent. Bolla 2013. This is their traditional method sparkler. The 2013 has 75% durella, pinot nero, got a light maceration and stayed 14 months on the lees. This gave a pink blush, some yeast and also some oxidative notes, like yellow or mature apples. 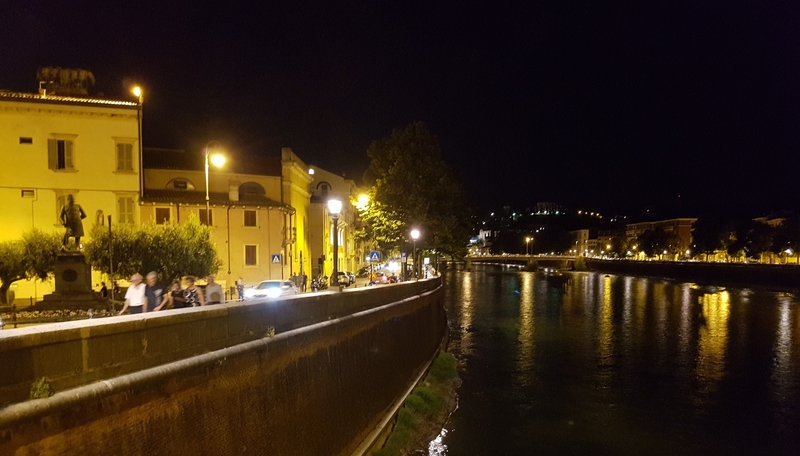 What followed now was like a “Capriccio Italiano”, a joyous ride over creeks and hills, with wines in a seemingly random order. Love it! On came a fresh and inspiring, waxy, appley, and a little smoky vespaiolo 2017. A teroldego-CS-garganega with light pink colour, flowers, pyrazine (sauvignon-like), with super fruit all the way. Brio 2017, in the Pop line and predominantly from cabernet franc, is a luscious, peppery carbonic maceration wine, made in cement tank. 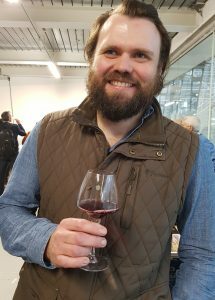 There was a fruity, partly carbonic maceration Barbera in both 2017 and 16 editions, the latter a bit more structured than the former. 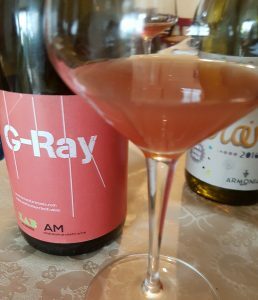 G-Ray is from something called the “Lab” line, where Andrea works with another Andrea, namely Marchetti, among other activities founder of the Vinessum fair. This wine is from pinot grigio on volcanic soil, it has been in contact with skins 8 days, no sulphites and no filtration. As you can see: Turbid light red or rosé; aromas of strawberry, apple; quite good concentration actually, and not that simple as you maybe might think. Lastly there was the Gioia of the Cru line. 2016 is from cabernet franc, hand-destemmed, no sulphites added, and no filtration. Pure, loads of red fruits, some pepper, and a promising tannin structure. 2012 (the first vintage of the wine), made from 100% carmenère, stayed in big oak tonneaux for 8 months: Some cigar box and pencil/carbon notes (graphite soil), with red fruits, and a good structure. 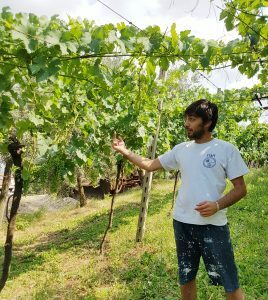 Lorenzo tells that they are a sort of incubator that helps young vignerons from Vicenza area to develop their own projects. These are: MaterVi (Alberto Rigon), Yeasteria (Jacopo and Esmeralda) and Do-line (Nicola Rigo). 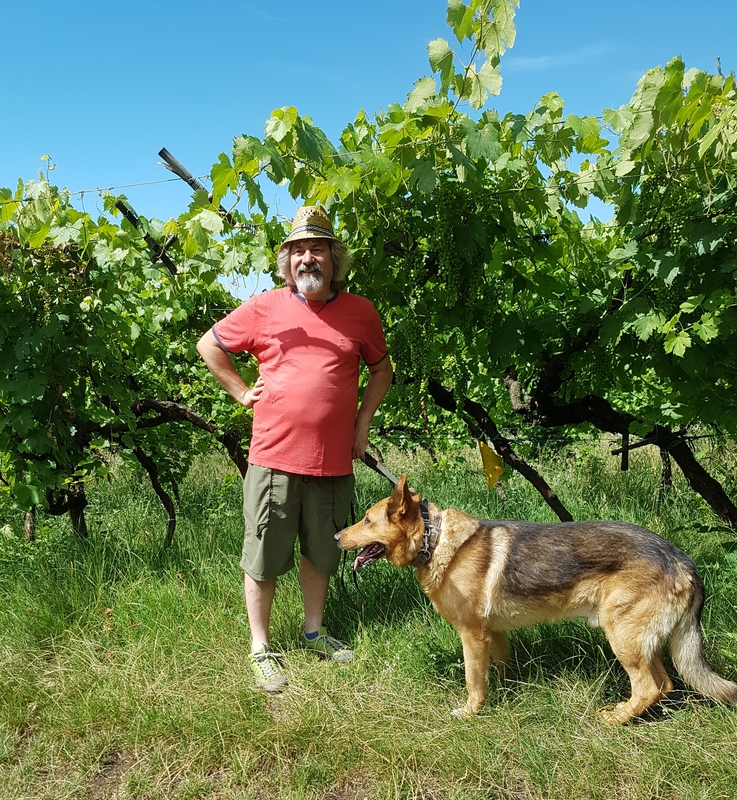 Small production (less than 10.000 bottles) and sharing the same philosophy (no interventions in wine-making and respect for the living environment) are requirements to participate. I think ‘s an honorable act supporting others in the same area and tradition, without seeing them as competitors. In the long run this will help the whole province, or region. Gambellara is a small village at the foot of Monti Lessini in the western corner of the Vicenza province. To the west it borders Soave (Verona). It has a DOC for the whole area, a “classico” designation for wines with lower yields and higher alcohol, and a DOCG Recioto di Gambellara. The DOC is comprised of 4 municipalities, most important are Gambellara and Montebello. When the prosecco boom took off, many of the grapes in the flatlands were replaced with the glera grape (formerly called prosecco). 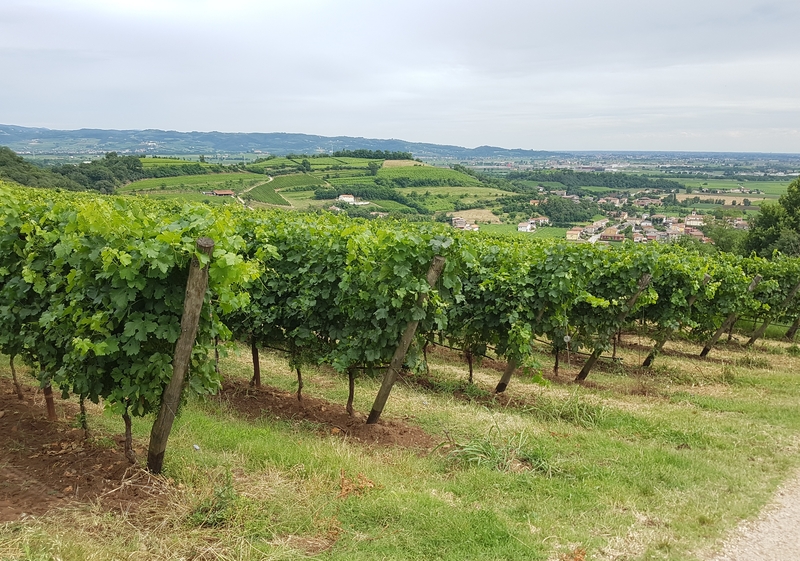 One of the results is that the general quality of Gambellara wine is extremely high, and as much as 60% of the grapes are grown in the hillsides. 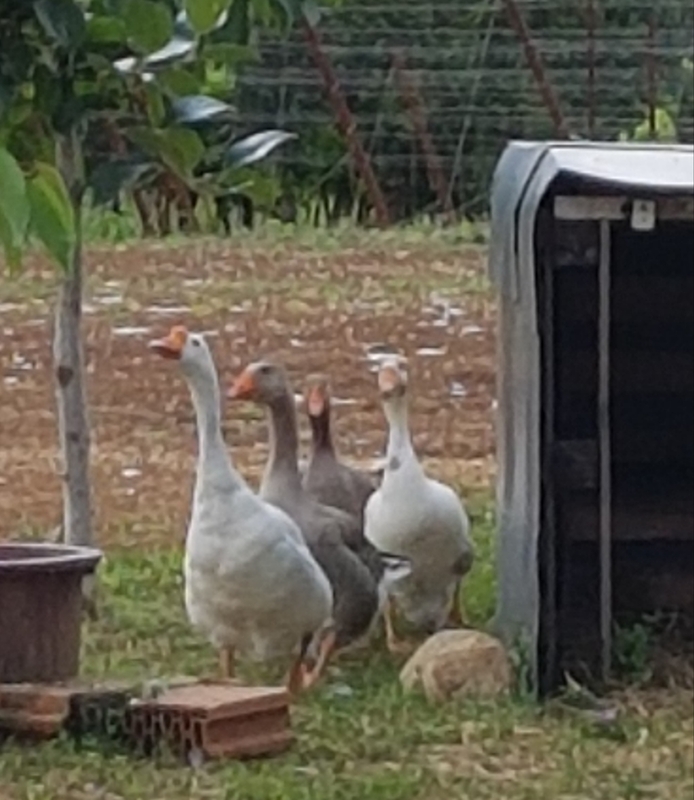 In one day I visited three of the best, in or around Gambellara village, and maximum 5 minutes drive from each others. 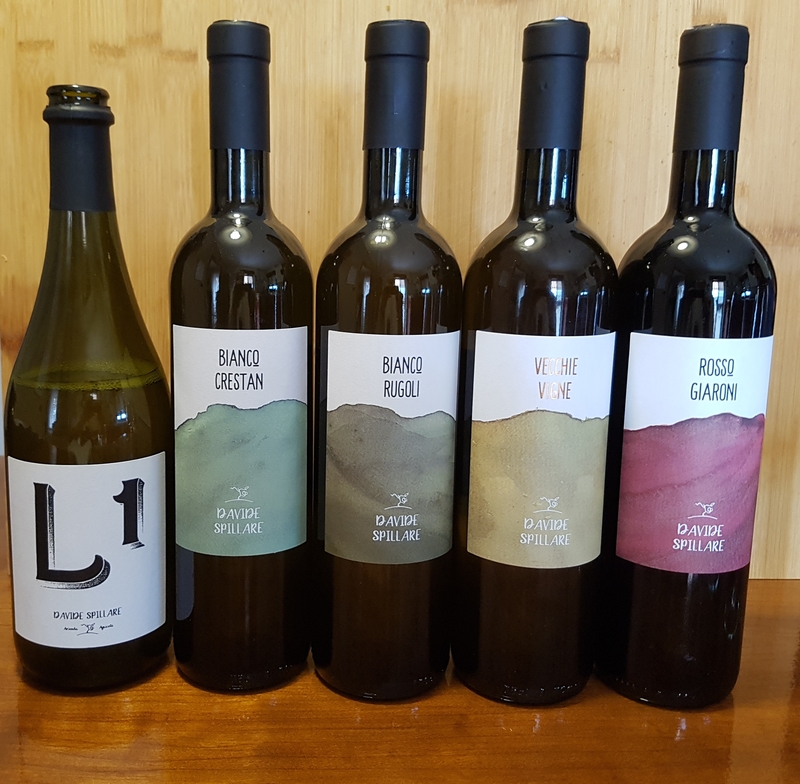 The most important of these is La Biancara, run by Angiolino Maule, who has been in the avant-garde of local and national natural wine movement and inspired many younger vintners. 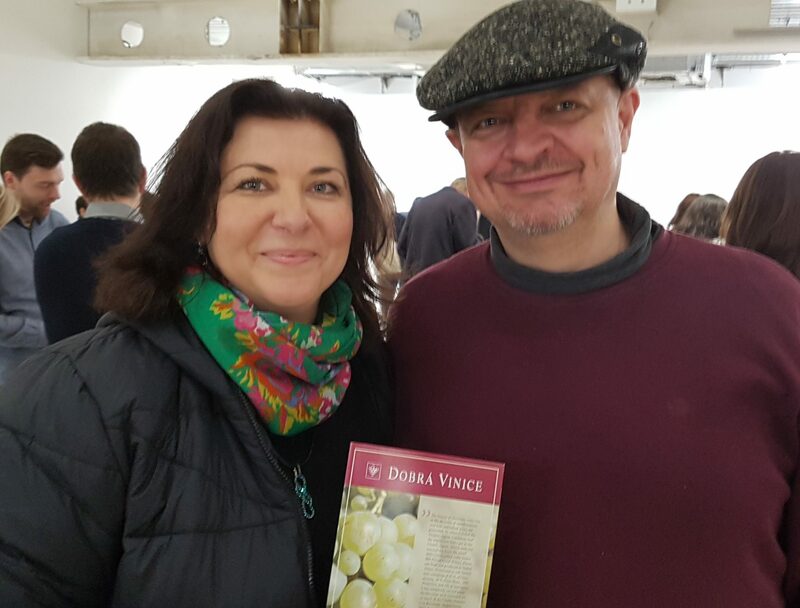 He founded the VinNatur organization in 2000 and leads the Villa Favorita natural wine fair held in Vicenza. 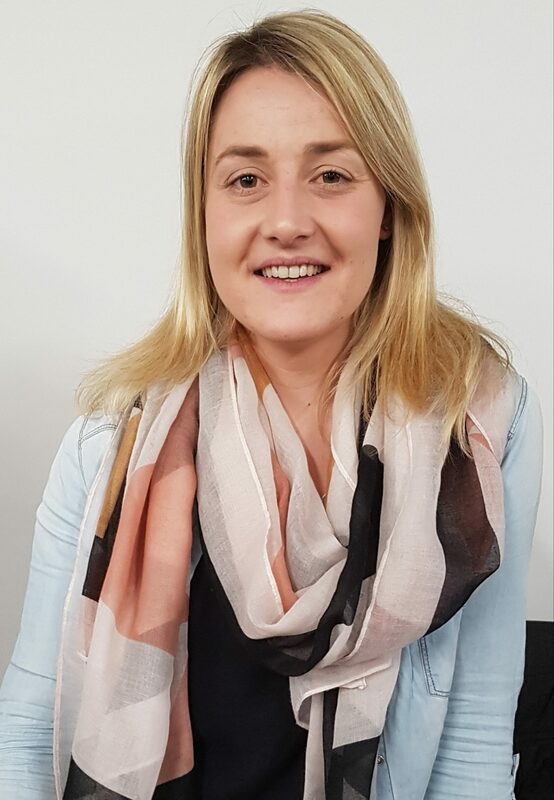 The objective is to establish contact between collegues, to be able to support and learn from each others. They are currently looking at the possibility of replacing copper and sulfur, widely used in organic farming, with plants and extracts that help vines build up resistance. Maule is now also studying the possibility to certify natural wines. 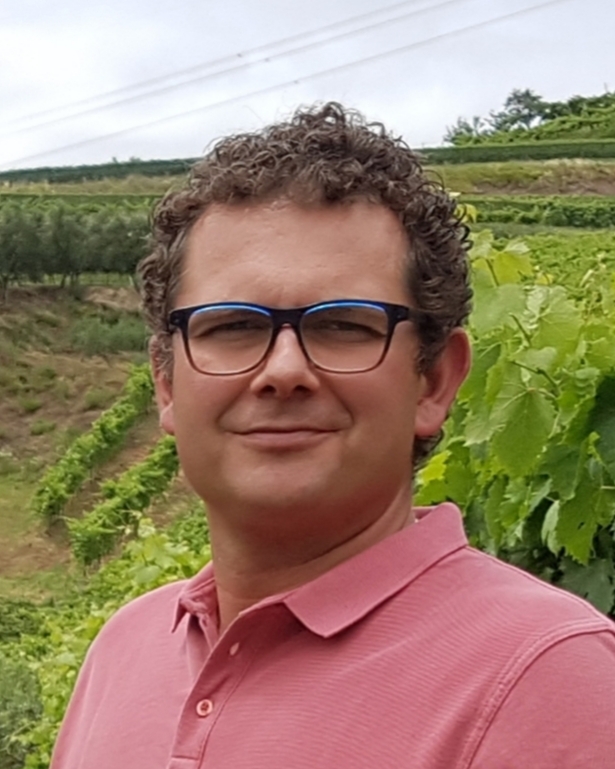 Most of Maule’s wines though, come under the IgT Veneto designation, as Angiolino can be said to have a general mistrust in the Consorzio, and the wines are not regarded “typical” by the them either. It’s Francesco Maule, one of Angiolino’s sons, who meets me on this warm summer morning. First we take a stroll through the vineyards and the estate, to get an overview. 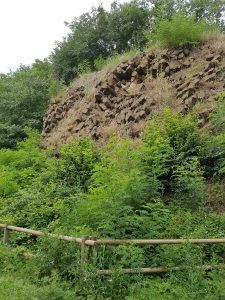 The soil of Gambellara is volcanic, with just a little limestone in the heights. This is easy to see from here. Maule has approximately 12 hectares own vineyards on south facing slopes in these hills, about 150m to 250m above sea level. They are managed in a strictly organically way. They use naturally produced plant compost and control fungal diseases with herbal teas and other natural products. Contrary to tradition, here the predominant binding technique is the Guyot, but also some pergola. Here around the winery there are 5,5 ha. garganega grapes, many of them used in the Sassaia wine. Higher up, as the name implies, the grapes for the Pico are grown. There is also some trebbiano and durella, and merlot and others for the reds. -After some years of “strange things” (high volatile, extreme skin-contact), some 10 years ago we decided to do some adjustments in the cellar, says Francesco. -We were lucky, as my father knew Josko Gravner (top Friuli producer with long experience in orange wines). He had also been making extremes wines, and then changed slightly. We also got some help from a retired enologist from Zonin (the region’s big player, just down the road). -Normally we don’t add sulfites, only in the cheapest wines, that can have quite high volatile acidity. Garg’n’go 2017: In 2017 we have problems with re-fermentation, so here are practically no bubbles. That’s the way it is with pét nat (natural pétillance/bubbles), when there is no nat pét, there is just one way to fix it: we have to wait. The colour is quite dark, with flavours of yellow apples, yeast, and good acidity from the durella grape (20%). We can imagine how it will be in good condition. -We have no tradition for bubbles, says Francesco. -My father never thought about it, but I love it, and it’s easy to sell. Francesco fetches another bottle, that has a little more bubbles. OK, so there is hope. 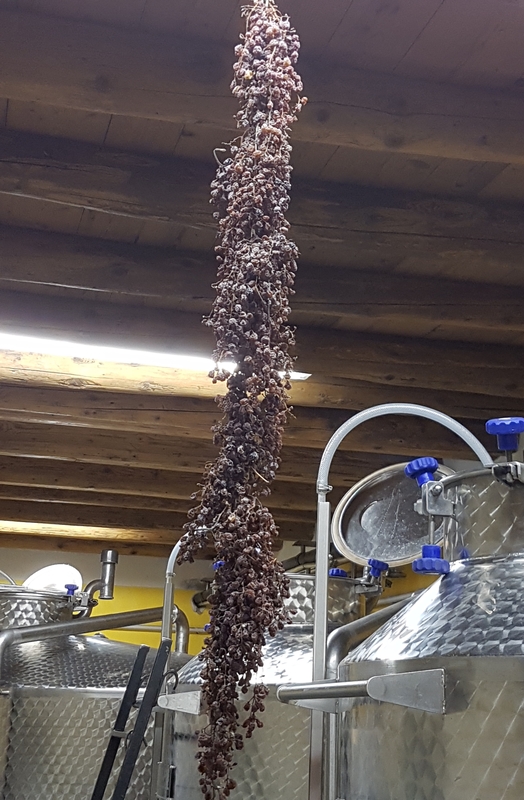 Over to the still wines, the first one all garganega: Sassaia 2016, as we said from the vineyard close to the house. 70% were directly pressed, the rest skin-macerated for 2-3 days, then barrelfermented. Because we don’t use SO2 tannin and polyphenol from the skin-contact help the wine to stay healthy and live longer. 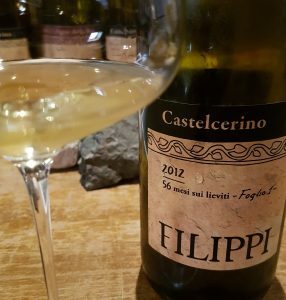 It shows a light golden colour; mature apples, white flowers, ginger (from garganega) and some toast on the nose; it’s quite full and very tasty. The relatively high altitude Pico has for me been a favourite, if I were to pick only one wine. Selected grapes from three relatively high vineyards, Pico 2016 was 50% directly pressed, an equal part had 2-3 days skin-contact. In fact there was also a tiny amount (one barrel, maybe 2%) that had extended skin-contact for 2 1/2 months. -’16 was a good harvest, and it rained at the right moments. The wine showed dark, almost amber; with mature apples, white pepper, ginger, a touch of honey; rich and glyceric in the mouth, with an integrated acidity and an extreme length. Rosso Masieri 2017 is a young and luscious, fruity and herb-scented red wine from merlot, tokai rosso (grenache) and cabernet sauvignon. See link #1 at the bottom of this post for more. Passito Monte Sorio 2015 is a recioto style, IgT (though they have a DOCG Recioto too). The garganega was harvested before the other grapes. They were all hung in vertical nets, for 4-5 months to dry. Then there was one week skin-maceration, and fermentation for 2-3 months. More normal is 14% and 150 grams residual sugar, but in this vintage the alcohol is 16% and sugar 76 grams. Some sulfites are added, simply because the wine gets cloudy after 2-3 years because of some protein bindings. Amber colour; on the nose: nuts, some raisin, iodene, lightly oxidezed style; on the palate: long and with a good acidity. Climbing downhill to the center of the village we find both our next wine people, the two Davides. Vignato is not an uncommon name in Gambellara, and in the short street I ring the doorbell at two other Vignato’s houses before the right one stands before me. 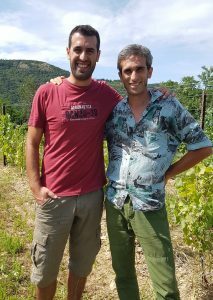 Davide is third generation vigneron, so he’s born and raised in the village. But he is the first to have organic wines certified as DOC Gambellara. He has 14 hectares of vineyards that are characterized by these mineral soils. He works them organically, with techniques like green manure. Grape varieties are mainly garganega, but also durella, glera, chardonnay and merlot. He takes me to the biggest of the two amphitheaters formed by the ancient volcanoes. 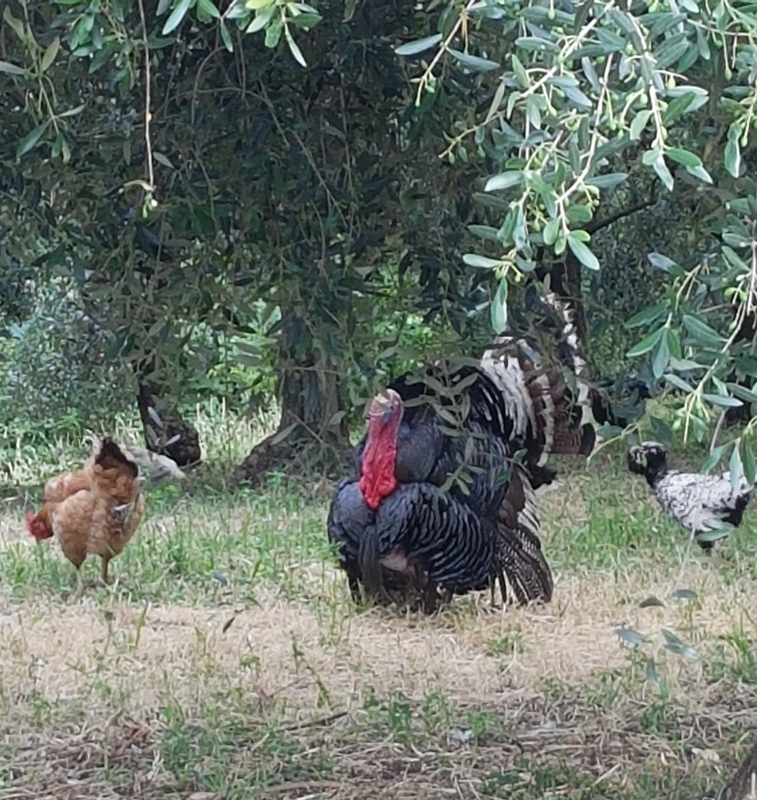 It’s the one in Gambellara, close to his home, the other is in the aforementioned Montebello to the east. 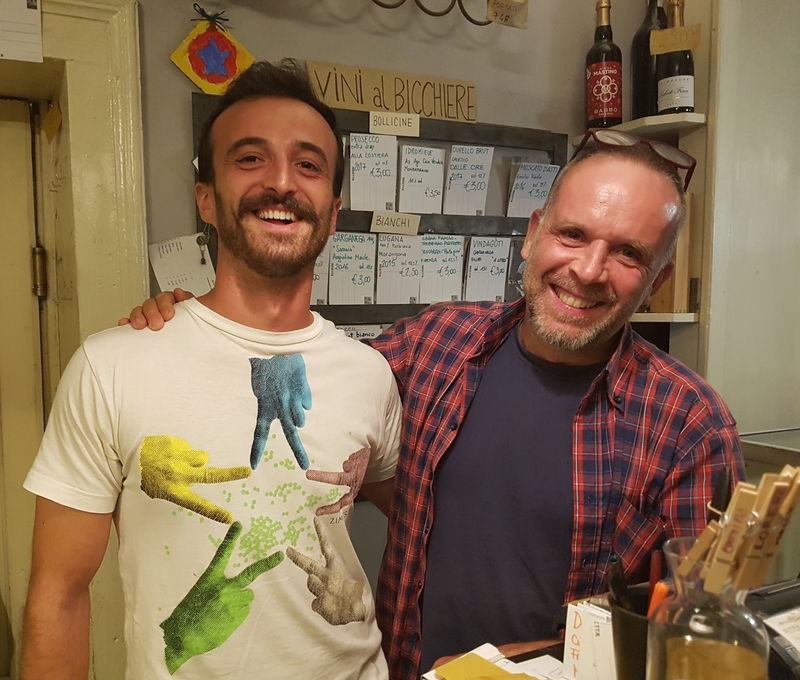 -I want to make organic wine, but I also want clean wine, for me this is important, Davide says. 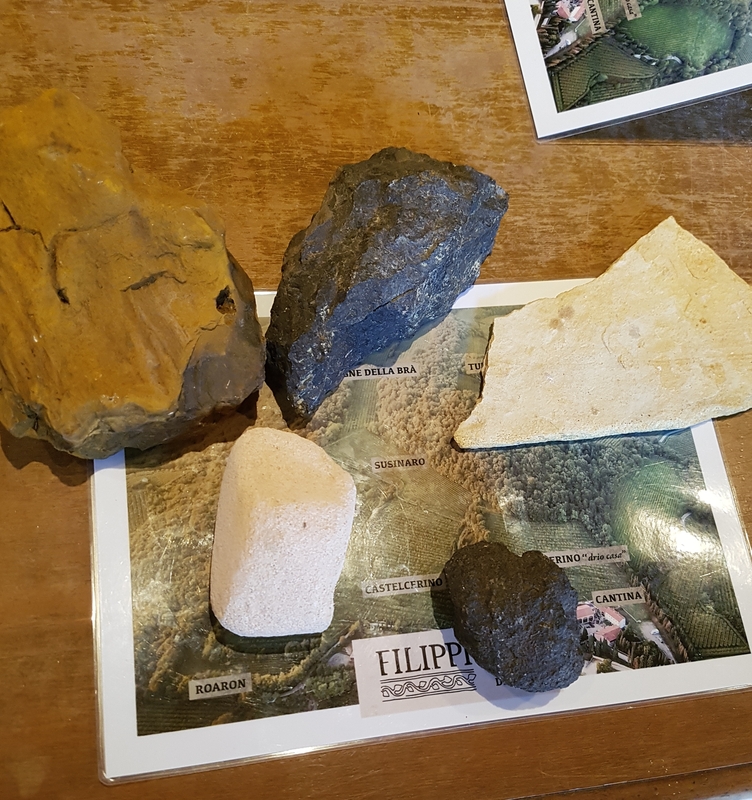 He also believes that the volcanic soil gives a salty, mineral character to the wines. Both these opinions can be backed by the tasting. Primo Incontro 2016, IgT Veneto: The “first meeting” is a garganega frizzante (light pressure), where the second fermention is catalyzed by some of the dried grapes. The yeasts remain in the bottle, so the “sur lie” technique is employed, with batonnage once a week. -The final bottling was done after 15 months, no SO2, so I prefer to do malo-lactic fermentation, says Davide. 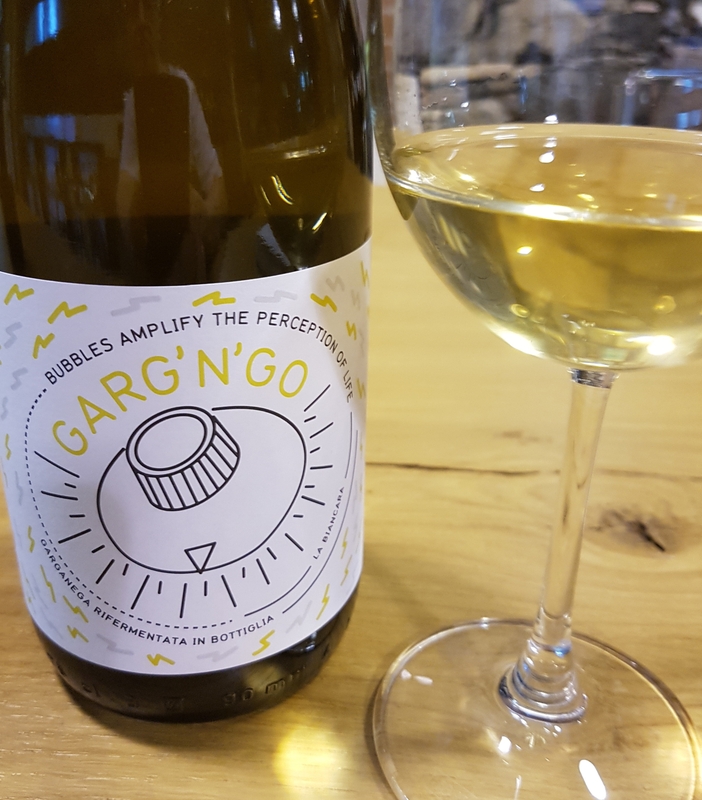 The wine shows a light yellow colour, slightly cloudy; aromas of apples, white flowers and citrus; there is a balanced acidity, a slightly salty, simple, good summer drink. Cuvée dei Vignato 2013: A spumante metodo classico (high pressure) from 90% durella, and the rest chardonnay, with 40 months on the lees. Somewhat lighter; green apples, citrus, bread crust; more evident, pungent acidity, long and mineral aftertaste. Then follow two still whites, both 100% garganega. El Gian 2016, Gambellara Classico, a tribute to his father Gian Domenico: This wine is from 25 year old vines in the hills. As usual: Natural yeast and only a small quantity SO2. It stayed on the lees in steel tanks for 5 months before bottling. Light straw colour; green apples, white flowrs, citrus, clean (no tropics); quite mellow in the mouth, but the acidity shines through, and typical for the garganega grape it has a nice bitterness towards the end. Col Moenia 2016 , Gambellara Classico: This is from 40 years old vines, and the grape selection is stricter. No de-stemming. It stays on the lees for 7 months, and batonnage is carried out once in a while. Light straw, clear; yellow apple, ginger; full on the palate, more concentration than the previous wine, and more integrated acidity (the harvest was 20 days later), slightly bitter aftertaste. 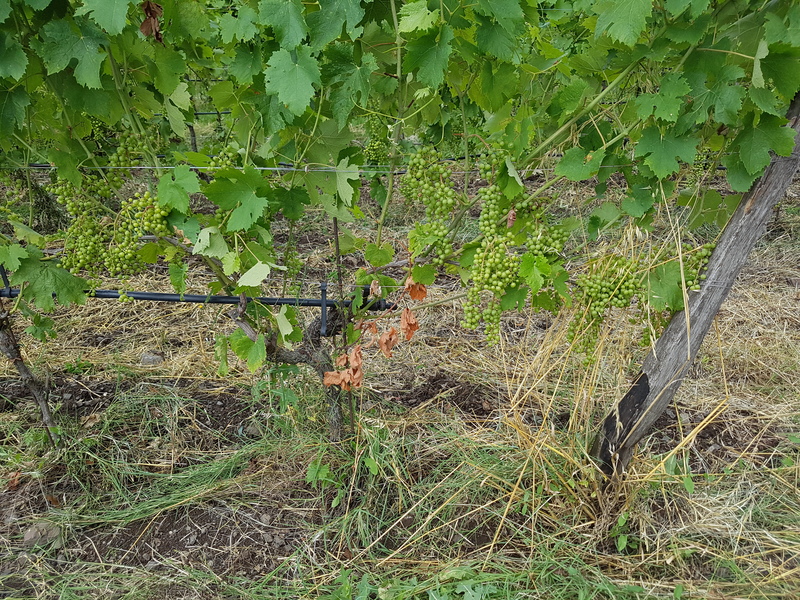 A general observation can be added here: Garganega has a long cycle, and late picking is normal. Durella is approximately one month earlier, around mid-september. Regarding the wine styles, at this point it should also be clear that Vignato’s wines are clean, the fruit is a bit more acid and the apple notes are greener. La Biancara is more turbid, obviously unfiltered, plays with oxidation, and the fruit is more yellow and mature. 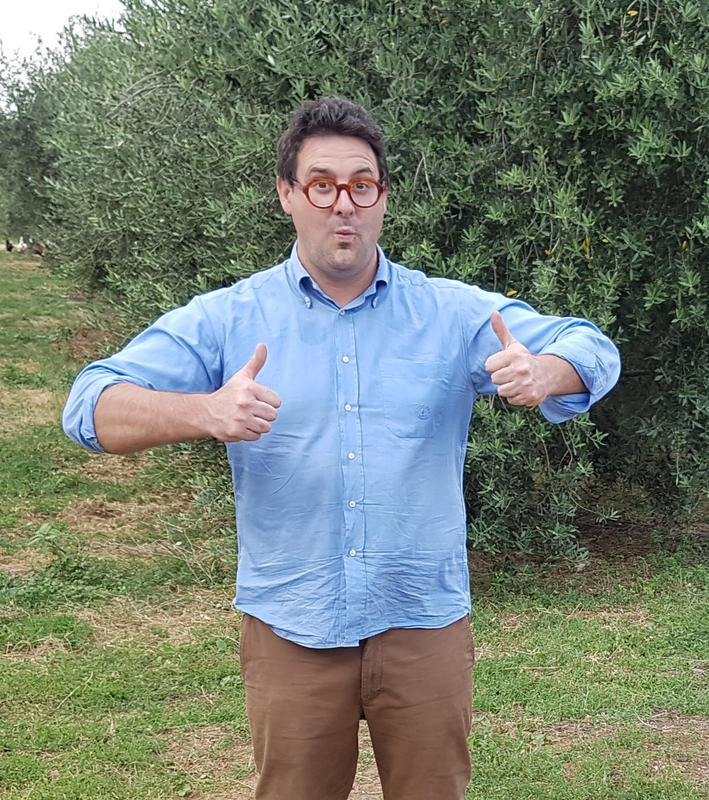 1950 Merlot 2016, IgT Veneto: -1950 was the year when my father planted the merlot vineyard for this wine, because he realized that he was tired of drinking only white gambellara, says Davide. The pressing is light, and the wine matures in steel tank with occational batonnage. The colour is ruby with some violet; with aroma of red fruits and some herbs; medium body, soft tannins, quite easy drinking really. Cal d’Oro 2009: This is a passito wine with mahogany (or dark amber) colour; iodine notes, umami, dried fruits and dates; some tannins, medium sweet (120-30 g), a bit raisiny, and also salt in the finish. Ca’ Ronchi 2007, Passito Rosso: Dark red, a little browning; red berries and forestfruits (morelloes, blackberries), nuts; quite slender, good tannin structure, medium sweet (same as the former), wonderfully balanced by acidity. After a sandwich and a coffee in the bar on Gambellara’s central square, I climb the labyrinths of the neighbourhood where Davide Spillare has his house and winery, and several of the vineyards are there too. I meet Davide together with Lanfranco Fossà, who helps him with various tasks in the office. A little background: Davide Spillare (his last name should have a stress on the first syllable) was born in 1987. He went to agronomy school, then worked 4 years for Angiolino Maule, to learn and to gain experience. In 2007 he started on his own. He is third generation. Antonio, his grandfather, worked in real estate, and made wine in the weekends. Mariano, his father, worked with machines and repair, he made more wine than his father, but he only sold it to the cooperative. So Davide’s project is in a way still young. 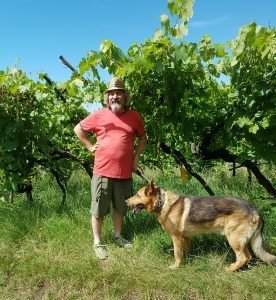 He owns 4 hectares of vineyards, and has 6 on rent (the latter will come into production from the 2019 vintage). In fact 50% of Davide’s production is today sold to Japan. The wines are also found in a handful more countries. I tasted them in London’s 40 Maltby Street wine bar. The annual production is now 20.000 bottles, and will increase to 30.000. Not very much. From Davide’s house there is a nice view over the village, and you can easily see the big Zonin winery. Davide has 5 labels, mostly garganega, except for some durella for sparkling (up to 70 years old), and also some merlot for the red. 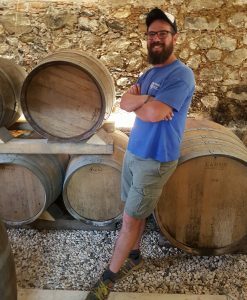 He employs biodynamic viticulture, and there is almost no technology in the cellar. The old vines are bound up in the pergola system, but for the newer plantings he uses Guyot. In the plains, at around 200 meters above sea level, there are clayey soils. The rest is mostly volcanic. In general we could say that after Vignato’s clean and clear wines we are now, not surprisingly maybe, back towards the style of Maule’s La Biancara. In a way the wines are elegant, with their crisp acidity. 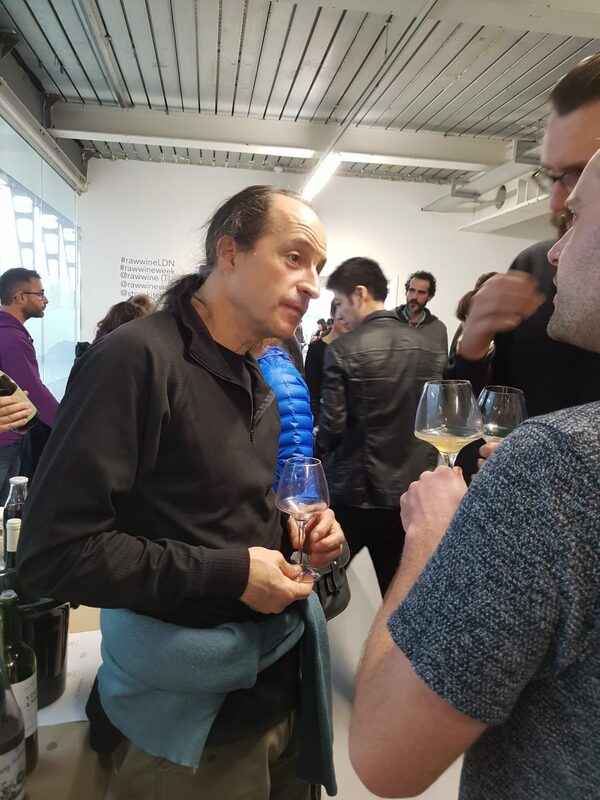 But they clearly take place in the natural wine category, without added sulfur, and no filtration or fining, so they also come with a rich mouthfeel and loads of taste. Here are some short notes from the tasting. Bianco Crestan 2016: 100% garganega, from the flat area (with less mineral soil). Straw yellow, aromas of green apples, citrus (lime); quite glyceric, mellow, a nice and simple wine for everyday drinking. Bianco Rugoli 2016 (12,5%): From the 80 old vineyard that gives name to the next wine, the bushes trained in pergola. Spontaneous fermentation, like all his wines, here in used oak barrels. The first bottle is bretty. Davide says it’s from the cork. When the water isn’t changed often enough this can happen. The water should be changed for every 100.000 corks. The nose is more complex than the previous, but maintaining a good acidity and a strong minerality. Straw yellow; more mature apples, wax, aromatic herbs; smooth yet fresh, fruit all the way (4-5 g/L acidity), slightly bitter aftertaste. 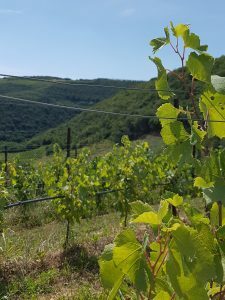 Vecchie Vigne 2016: It had 100% skin-contact for 5 days, then fermented in barrel 7-8 days. 13,5% alcohol. Golden; more mature apples on the nose, together with pear, honey and nuts (it was a very late harvest); concentrated on the palate, a warmer, richer style, with a salty mineral aftertaste. This wine is still young though, and will open more. Rosso Giaroni 2016: Merlot at 13,5%. Dark cherry, me green pepper, red fruits; fruity, bit tannic. 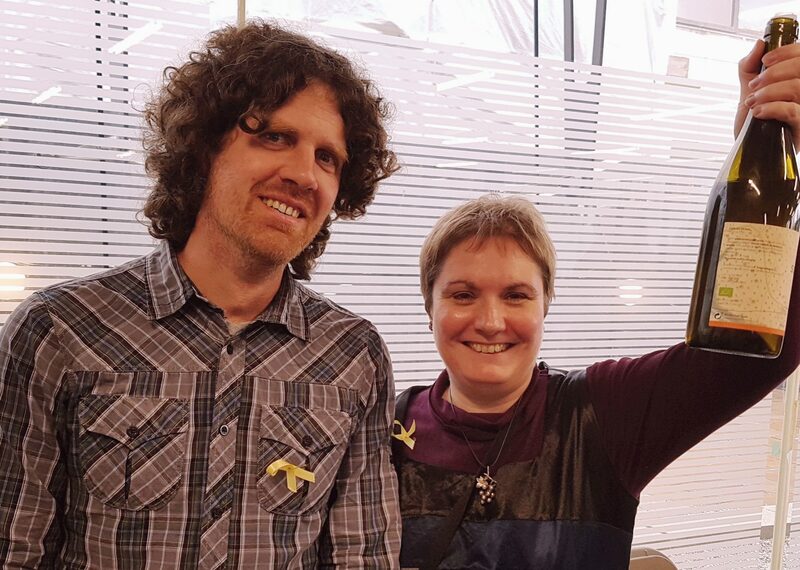 London’s Raw fair is over. 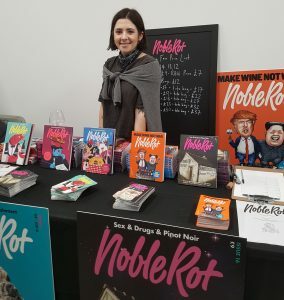 This wine fair, founded by Isabelle Légeron (now also with meetings in Berlin and New York), is a two day celebration of individual, organic wines with a wide range of exhibitors. But what unifies them is their desire to express their place in their own unique way. Some have a no sulphur approach, while some are more pragmatic to this question. This year the fair was back at the Strand, in central London, after two years further east. The venue is open and clean with good light, good for wine tasting. 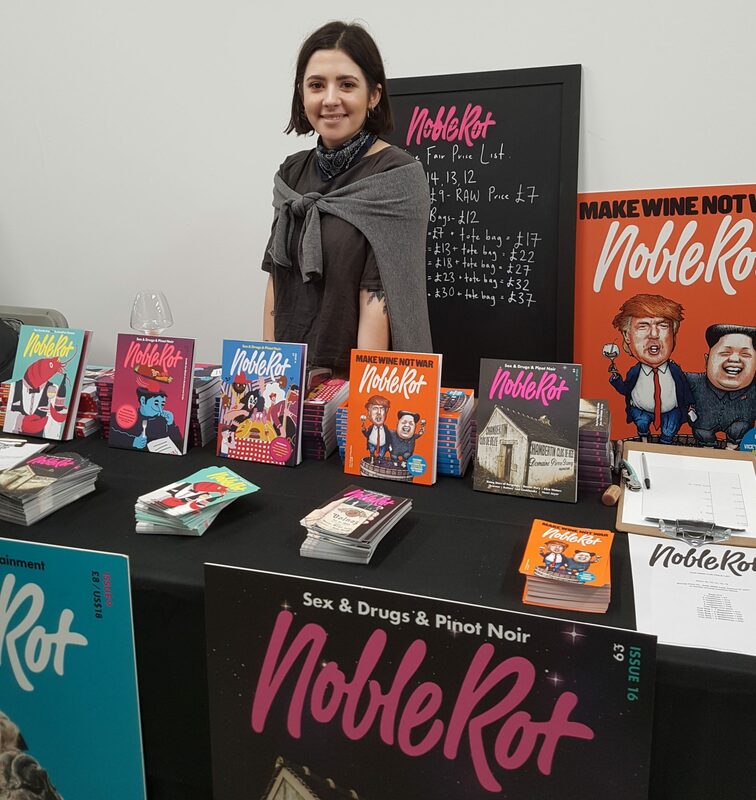 Wine bar and restaurant Noble Rot had their stand, and it was possible to savour food of many sorts. Most of the artisans came from Europe. The bigger wine producing countries like Italy and France, and to a certain extent Spain, had their fair shares of exhibitors. But smaller wine countries were also represented, maybe most surprisingly Romania and the Czech Republic. Among the more established producers, especially in this context, were Eric Texier (with expressive wines from Côtes du Rhône), the Catalan trio Mas Martinet-Venus la Universal (from Priorat/ Montsant, with increased focus on fruitiness than before), and mainly sparkling wine producers Mas de Serral- Pepe Raventòs and Recaredo-CellerCredo, Frank Cornelissen (who really has become a top Sicilian producer in every respect), not to mention Friulian neighbours Radikon and Gravner with their textbook skin-contact wines. There were many contenders. 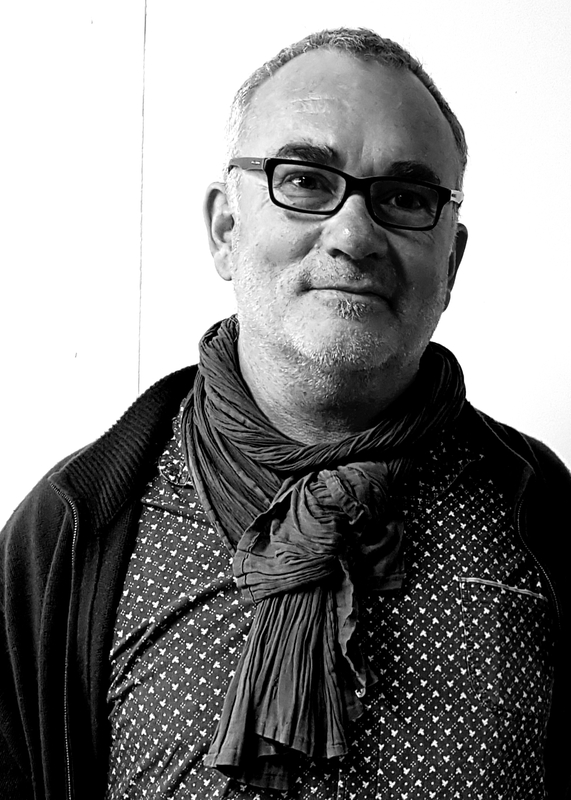 Aside of the aforementioned ones here producers that I have appreciated for a long time were from France, Dom. Milan (Provence), Dom.de Clovallon (Languedoc); from Italy, Carussin-Bruna Ferro (Piemonte), Corte Sant’Alda (Veneto), 1701 (Franciacorta); Spain, Vinos Ambiz (Gredos/ Madrid); Portugal, both two participants, Quinta da Palmirinha (Minho) and Casa de Mouraz (Dão); Austria, Meinklang (Burgenland). But not least is this an occasion to be surprised. Here follow some memorable moments. A light entry here: A luscious, inspiring côtes du rhône. Light ruby; red berries, herbal, lightly spiced; juicy, fresh, just a hint of tannins, good acidity. A light, elegant vintage of this wine. 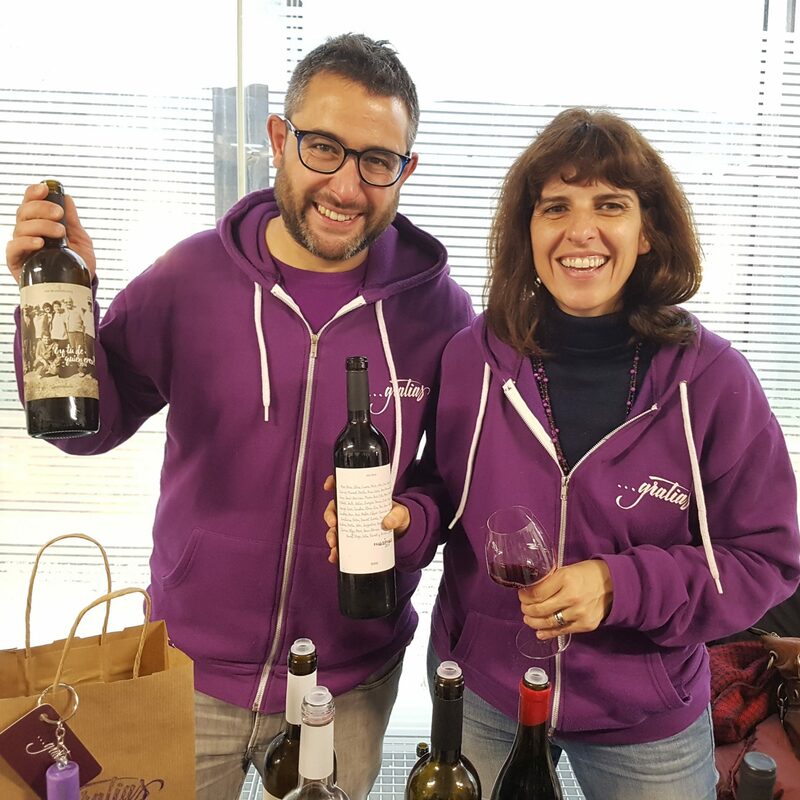 Carles Mora Ferrer and his close friend Montse have produced natural wines since 2008; no chemicals, no additives. I chose their cabernet; not pressed, fermented in inox, 20-25 days of maceration. Total sulphites is a mere 4 mg/L. Dark cherry, violet hint; red fruits, blackcurrant, green pepper; structured, good acidity. 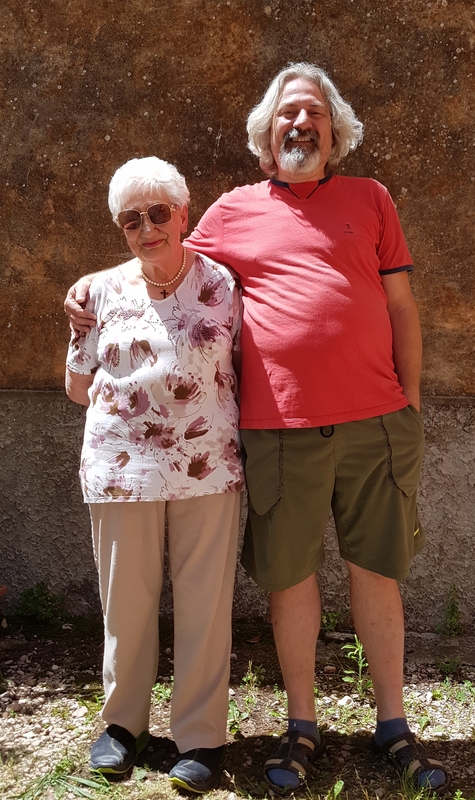 Mas Martinet has been a favourite for many years, and maybe the most influential among the Priorat “pioneers” from the 1980’s, thanks to both father Josep Lluís’ teachings, daughter Sara’s and son-in-law René’s consulting and general inspiration through their wines. Sara Pérez, current winemaker, was also in the avant-garde when turning to organics in the early 2000’s. 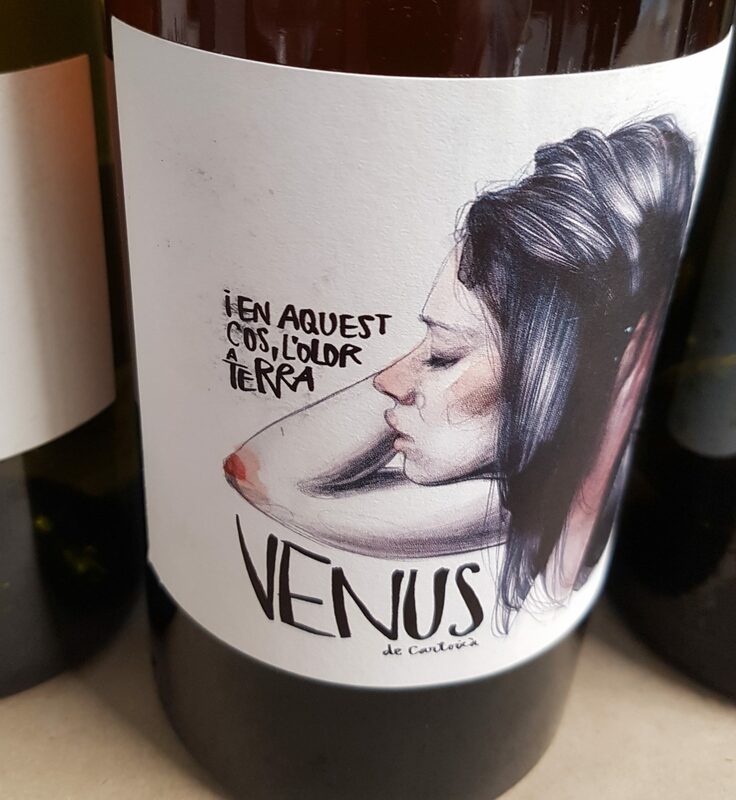 Venus is their side project in Montsant. Here I chose their white Venus, a varietal xarel.lo, fermented 20% with skins and elevated in big barrels. No added sulphite. Yellow colour; very fresh, citrus, litchi some balsamic; glyceric, creamy and saline. So expressive! (‘gratias mecenas’) who believed” in the project, as they say. Fermentation was carried out in small deposits of 5 hectoliters, with whole clusters. The ageing was carried out no the lees, in oak, jars and steel. No clarification or cold stabilization. Dark cherry colour; red and dark fruits, a hint of spice; juicy and drinkable, but also with a touch of dryness (from the stems). 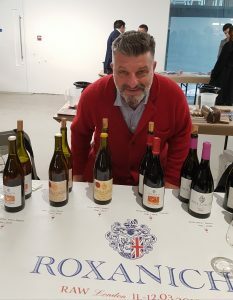 Here were several surprises at one stand: A new, young producer in the remote Arribes, Castilian area bordering Portugal. Furthermore the man behind the bodega is Danish, Thyge Benned Jensen. I’m learning every year, says Thyge, which is good. But much is already very good: Taste his two-weeks skin-contact Naranjito, another surprise for this region. The variety is doña blanca (even he the label indicates something else). Yellow with orange tones; mature apples, some peel; quite glyceric, with a purple acidity. A wine from the Podyji national park in Moravia, Czech Republic, a blend of veltlín, ryzlink and sauvignon, as the back label reads. Light colour; gooseberry, white pepper; both round and light, but with good acidity too. See also an article about Moravian wines tasted in England here. 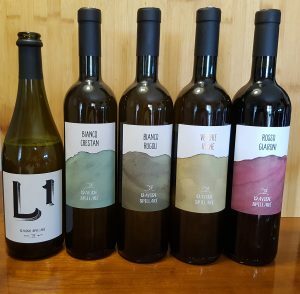 Roxanich of Croatian peninsula Istria makes powerful natural wines. This is a field blend including syrah, cabernet franc, lambrusco, barbera, borgonja, malvasia nera. Bottling went without filtration, after 9 years of aging in big wooden vats and barrels. I like the reds. But the white ones, most often orange in colour, really has an unequalled quality. You can read more about them and another featured wine here. Red, developed colour (towards orange); a volatile feeling, mature red berries, dried fruits and roasted almonds; weighty, packed with fruit, plays with oxidation. Fernando’s wines are marked by the Atlantic influence. His whites are covered several places on this site. This time he showed that the light (light-weight, not light in colour) vinhão can be fascinating when aged too. So that must be the choice. Dark with violet and some red; incredibly fresh, cherry and tint; round, mineral, with integrated acidity. It has an uplifting lightness, a feeling of weightlessness. Corte Sant’Alda is a well-known Valpolicella producer, mostly in the more classic end of the spectrum. 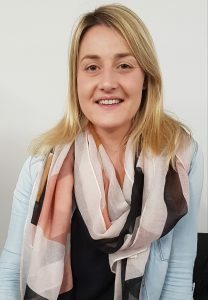 But the wines are thoroughly made, they are good, and they have nothing of the negative characteristics that the area has become known for in many wine circles today. Their classic wines are good. And Marinella presented an intriguing varietal molinara rosé aged in Tuscan amphorae, a vino de tavola with a total of 2 mg sulphur. Salmon pink; flowers, strawberry and a touch of white pepper; no the palate quite smooth, but also with a surprisingly high acidity. Complex aroma of mature apples, nuts, flowers, apricot, towards honey; medium full on the palate, and a salty, mineral aftertaste. Integrated, natural acidity. Soave signifies something soft and mellow. This area itself is not especially dramatic either. But the geography is capable of showing big differences in expression. And garganega, the most prominent grape in the area, is a very successful interpreter of these different terroirs. For me, both aspects were clearly demonstrated for the first time, in a guided tasting during the VinItaly fair in nearby Verona some years ago. Cantina Filippi disposes of the highest vineyards in the Soave area. 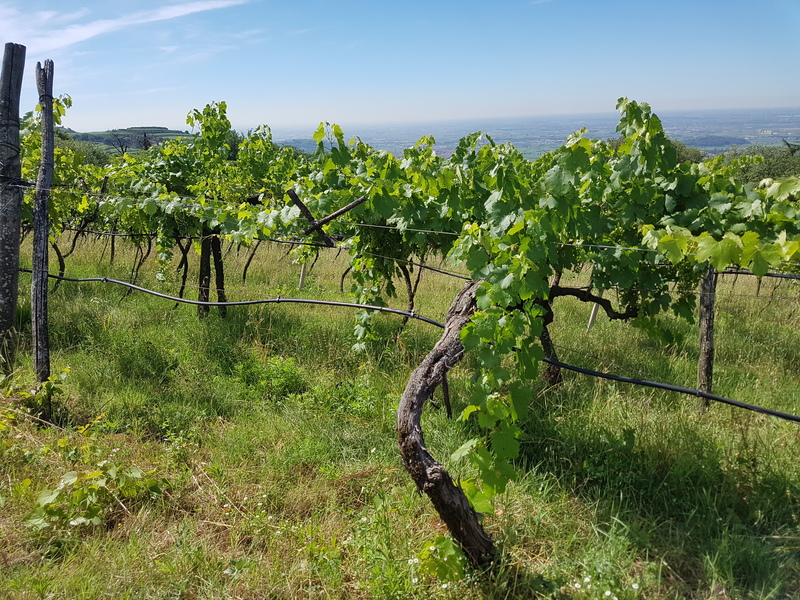 400 meters above sea level might not seem enough to challenge your fear of heights, but all is relative, and these plots have an advantage over other Soave sites in terms of natural acidity. Most of their 16 hectars of vineyards were planted in the 1950s. These are divided into several crus with different characteristics. In all vineyards organic farming is practised, and the soils are volcanic rock, limestone and clay. Filippi keeps the pergola training of garganega inherited from his ancestors. He doesn’t wish to blend garganega with more acidic grapes, as he more appreciate a saline form of minerality. Having said this, 6 g/L isn’t that low either. The wine was fermented with native yeasts is stainless steel, and it stayed on fine lees for around one year. Not filtrated. Light yellow. Mature apple and some citric notes in the aroma, some nuts and saline minerality. Round and mellow in the mouth, a slight bitterness in the finish.